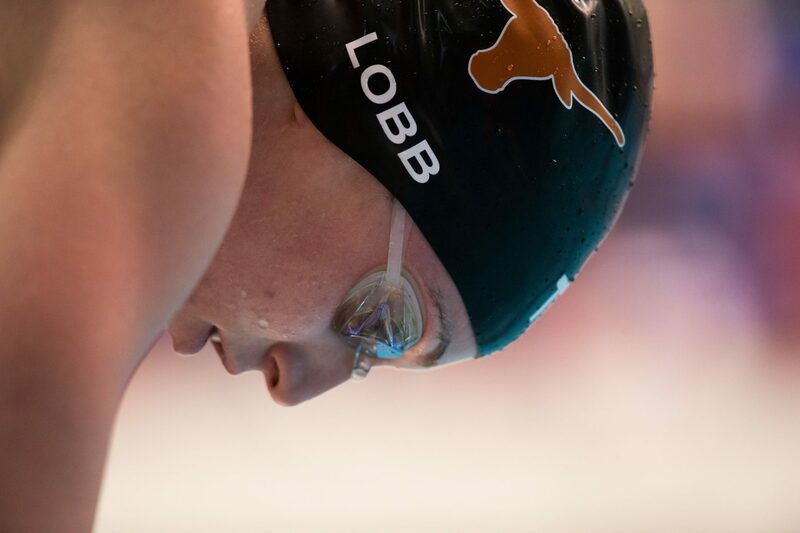 Texas' Ellen Lobb smoked her way to a 22,1 and the top seed in the women's 50 free in prelims this morning at the 2014 Big 12 Championships. The second day’s finals session at the 2014 Big 12 Championships will still be dominated by the Texas Longhorns; that will be the chorus echoed throughout the meet. However, there is just enough variety in the start lists for the evening session tonight to keep things interesting. That includes a top seed from West Virginia in the men’s 50 free, and four finalists from not-Texas in the women’s 50 free (it sounds like a small victory, but it is a victory for parity none-the-less). Keep in mind throughout this meet that Texas has a “B” team entered. They can swim prelims, and their times count, but they will be ‘bumped’ from higher finals by anybody on any team’s scoring roster, and will be only allowed to swim, unscored, in finals if there’s a lane after all of the scorers have been placed. See the full prelims recap here. Update the page frequently, as we’ll be doing recaps while the events happen. In prelims, Texas juniors Kelsey Leneave and Kaitlin Pawlowicz had finishing times in this 500 free just .03 seconds apart, and swam fairly similar races. In finals, they were again very similar through the first 300 yards, both staying within a couple-of-tenths of each other for most of that first few minutes of the race. But then, Leneave put her foot on the gas, and started to pull away from Pawlowicz, and she wound up winning the event going-away in 4:42.92. That’s over a three second improvement from her prelims time: almost all of which was done in the last 200 yards. Pawlowicz came in for 2nd with a 4:46.18, almost matching her prelims mark, and held off a hard-charging finish from Iowa State freshman Karyl Clarete. That absolutely obliterates her own school record, set earlier this season, at 4:52.17. The times dropped off after the top three, with TCU’s Mikayla Winkler placing 4th in 4:51.19, West Virginia’s Emma Skelley placing 5th in 4:51.39, and Texas’ Kimmy Phillips was 6th in 4:52.37. Kansas’ Morgan Sharp finished the race in the top four, but was DQ’ed after the swim for a false start. Her teammate Malia Johnson did win the B-final though in 4:49.94. The men’s 500 free was a nailbiter of a race between three Texas Longhorns: Clay Youngquist (4:15.68), Jack Conger (4:15.73), and Sam Lewis (4:16.06). All three swimmers stayed mostly together in the early part of this race, though it was the sophomore Lewis who pushed the pace early as the top seed coming out of prelims. In the last 100 yards, though, Youngquist and Conger reeled him in, and both eventually overtook him at the touch. Conger had the fastest closing split of the three with a 24.17 on his last lap. It’s worth noting that of the three, that’s only a best time for Lewis, which shows sort of where the Longhorns are at right now. Clark Smith completed a Texas top-four in the race with a 4:23.70, and was followed by a 4:24.5 and 4:25.1 from West Virginia’s Nathan Cobbe and Daeton Davenport, respectively. Off of the Texas “B” squad, which can’t score at the meet, Nic Munoz was a 4:20.60 in the Consolation Final. Texas’ under-the-radar freshman signing this season Madisyn Cox has been huge for the Longhorns all year long, and on Thursday night she took her first Big Ten title with a 1:56.31. That almost identically matched the 1:56.29 that she swam in prelims, although in finals she was at least gunning for a better time – having gone out much faster in the first 150 yards. Texas’ Gretchen Jaques took 2nd in 1:58.03, but she’s already locked in for NCAA’s, so this is more of a dress-rehearsal for hber. Kansas’ Chelsea Miller was the only swimmer in the top 8 without a black-and-burnt-orange cap on, marking a 1:59.25 for 3rd, and another Texas freshman Tasija Karosas rounded out the sub-two club with a 1:59.60. Texas’ Skylar Smith (2:00.17), Victoria Cassidy (2:00.22), and Shelby Webber (2:02.66) capped off the top 7, with Iowa State’s Sarah Deis placing 8th in 2:03.55. Texas freshman Austin Vacek, who Eddie Reese said earlier this year would ‘make his famous’ in an interview on SwimSwam, so far looks so good. He won the 200 IM for his first Big 12 title in his first attempt, with a 1:46.05. The top three Texas swimmers in this A final all got out to a very fast start, but West Virginia’s Jake Querciagrossa had a hard closing half of his race to overcome all but Vacek for 2nd place in 1:46.52. Four of the top five finishers in this race were all freshmen; Texas’ Will Glass was 3rd in 1:46.55, Texas’ Will Licon was 5th in 1:46.62, and West Virginia’s Nate Carr was 5th in 1:46.67. Querciagrossa is a senior. TCU’s Cooper Robinson, a backstroker by trade, was 6th in 1:47.53, and the A-final was finished out by John Martens (1:48.03) and Chris Brill (1:49.63). Texas’ Grant Rogers, who is on their non-scoring team, was a 1:46.70 in the Consolation Final. Texas’ Ellen Lobb has been having a tough season, by her admittedly lofty standards, this year. But after tipping the defending NCAA Champion Margo Geer in the Longhorns’ last meet of the season in this 50 free, her confidence looked high as she dominated the field with a 22.04 in the women’s 50 free. For the outgoing senior, that his her third-straight Big 12 title in the event, and the fastest of her three wins to boot. Her teammate and fellow senior Sam Tucker took 2nd in 22.75, and a third Texas senior Lily Moldenahuer tied for 3rd in 22.78. Moldenhauer tied with Iowa State junior Amanda Paulson, who incidentally also tied the Iowa State School Record (that she owns). West Virginia’s Courtney Parenti (22.97) and Jaimee Gillmore (23.03) took 6th and 7th, followed by the only two freshmen in the A final: Julia Sanders from TCU (23.09) and Brynne Wong from Texas (23.10). A little bit of history was made on Thursday night in Austin, as the West Virginia men picked up their first individual Big 12 title in the team’s two years in the conference, thanks to junior Tim Squires in the 50 free. There, he went a 19.32 to beat an impressive group of Texas Longhorns sprinters. That included a 19.48 from Texas’ sophomore transfer Matt Ellis – who looks like he’ll prove to be as important for Texas this year as he was for Georgia last year. He was followed by teammates Tripp Cooper (19.69), John Murray (19.81), Charlie Moore (19.84), and Kip Darmody (19.95). Along with Keith Murphy (19.87 – non-scoring team) and Caleb Weir, who did so earlier in the season, that’s 7 Longhorns under 20 seconds in the 50 free so far this year. Weir was 10th overall in 20.07 in the Consolation Final. The Texas women dominated the 400 medley relay, running away with a 3:33.09 and an NCAA Qualifying Standard – beating runners-up Kansas by 8 seconds. The winning squad consisted of Lily Moldenhauer (52.00), Gretchen Jaques (1:00.07), Ellen Lobb (52.60), and Sam Tucker (48.42). Kansas’ 2nd place relay included a 54.8 backstroke from freshman Yuleya Kuchkarova, and Iowa State was 3rd in 3:41.81. The Texas men didn’t have quite the same runaway victory, but they did still win with some ease, marking a 3:07.12 in the men’s medley relay. That included some really good splits: Kip Darmody led off in 45.92, Imri Ganiel was a 52.75 on the breaststroke leg, Jack Conger was a 45.8 fly, and Matt Ellis anchored them in 42.64. West Virginia took 2nd in 3:11.11, with a 46.14 leadoff from senior Bryce Bohman and a 42.84 anchor for Tim Squires. TCU was 3rd in 3:13.58, with a 53.70 breaststroke split from sophomore Ford Story. Nevermind. I guess their class of recruits from last year (if you include Ellis) could also be A-final worthy. Still impressive, especially once we get to see what those four guys all do in March (assuming they’re swimming NCSA). Congratulations to Tim Squires and West Virginia for a great swim and win. Nice to have some variety at the top of the podium every now and then.